Sometimes I feel that there is a need for parkrunners Anonymous. I can imagine getting up at meetings of fellow addicts and saying ‘My name is Christian Wolmar. I am a parkrunner and I am an addict’. A parkrun in fact has precisely the reverse effect of a drug. With drugs, you take some, feel high for a while and then probably feel lousy for longer. parkruns are the opposite. The runs are hard. Somehow, I can’t just do one gently. I have to put in an effort, not because I want to catch up that chap ahead who I know is older than me, but because I am running against myself. The times of my 87 runs in fact are in a very narrow range of less than four minutes despite the fact that I started in 2009 and am now 67, I want them to stay that way. I am battling only against myself and my age but that does not make it easier. However, within a couple of minutes of finishing, the high kicks in and lasts all Saturday. Nothing compares with a parkrun. My regular jogs are great, sociable and enjoyable, blessed as I am with proximity to Hampstead Heath, but parkrun is the high point of the week. It’s got everything: The run itself, the greeting of friends and acquaintances, seeing the effort that so many people, young and old, put in, the camaderie and the fabulous work of the volunteers. One of the real pleasures is going to away grounds, as it were, and running on strange turf. Whenever I am away on a Friday night, I seek out the nearest parkrun and join in, knowing that I will receive a warm welcome. Consequently I have been to Tewkesbury – surely one of the prettiest with the Abbey as a backdrop – Derby – in a lovely park – Milton Keynes and numerous London venues. I have half a dozen parkruns within an easy cycling distance of where I live in Holloway, north London, and have my Highbury Fields parkrun, with its five laps, my home run as it is slightly less challenging than Finsbury Park or Hampstead Heath. 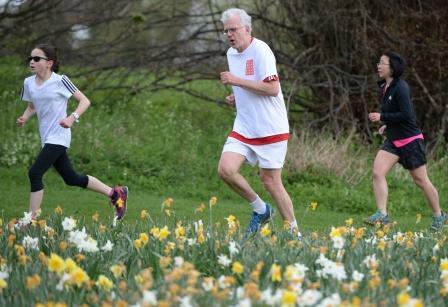 I aim to reach 100 parkruns this year to get the coveted milestone shirt and have calculated that by running a parkrun every three weeks, I can reach 250 around my 75th birthday. Fingers crossed. The one aspect that is slightly disappointing is that there are not enough runners like me. I am not a lifelong runner, having taken it up at 53 but it is a vital part of my life, keeping me both fit and mentally alert. There are a few lifelong runners, lean and ridiculously fast, in my age group but not enough ‘amateurs’ like me. Consider that in 290 Highbury Fields parkruns, there have been only 48 male runners in the 65 – 69 age group, half of whom have done only one run and only five, including me, have done more than 10. It is even more the case with women of my age group. At Highbury, there have been only 10 women running the course in the 65-69 age group, who have run the scant total of 23 runs in all. This is not good enough. We need to get older people to join in, especially in places like Highbury where there are lots of very fit and speedy young people. Indeed, I think young people can help here, encouraging their mums and dads, uncles and aunts, to come along by stressing that all are welcome and that parkrun is not a race, only a test against oneself. There is a barrier to overcome here but the benefits could be enormous. There are plenty of heartening tales in the weekly newsletter about how parkrun has changed people’s lives, got them fit, cured them of diabetes, enabled them to overcome setbacks and so on. But we need more of these stories, especially aimed at people like me, who may be of pensionable age but are still all in one piece.